For other people named James Webb, see James Webb (disambiguation). Tally Ho, North Carolina, U.S.
James Edwin Webb (October 7, 1906 – March 27, 1992) was an American government official who served as the second administrator of NASA from February 14, 1961 to October 7, 1968. Webb oversaw NASA from the beginning of the Kennedy administration through the end of the Johnson administration, thus overseeing all the critical first manned launches in the Mercury through Gemini programs, until just before the first manned Apollo flight. He also dealt with the Apollo 1 fire. In 2002, a planned space telescope, originally called the Next Generation Space Telescope (NGST), was renamed the James Webb Space Telescope as a tribute to Webb. Webb was born in the hamlet of Tally Ho in Granville County, North Carolina. His father was superintendent of the Granville County public schools. He completed his college education at the University of North Carolina at Chapel Hill, where he received an A.B. degree in education in 1928. He was a member of the Acacia Fraternity. Webb became a second lieutenant in the United States Marine Corps, and he served as a Marine Corps pilot on active duty from 1930 to 1932. Webb then studied law at The George Washington University Law School where he received a J.D. degree in 1936. In the same year, he was admitted to the Bar of the District of Columbia. Webb began his long career in public service in Washington, DC, by serving as secretary to US Representative Edward W. Pou of North Carolina from 1932 to 1934. Pou was chairman of the Rules Committee and Dean of the House. With Webb's assistance, Pou was influential in pushing through the first legislation of Franklin Roosevelt's New Deal during the first hundred days of Roosevelt's term. In addition to his secretarial duties, Webb provided physical assistance to the aging and ailing Pou. He next served as an assistant in the office of Oliver Max Gardner, an attorney, former governor of North Carolina and friend of President Roosevelt, from 1934 to 1936. Gardner supported Webb in finishing his law degree. During the Air Mail scandal of 1934, the government halted the carrying of airmail by private airline companies. A group of airline executives, led by Thomas Morgan, the President of the Sperry Gyroscope Company in Brooklyn, hired Gardner's firm to represent them. The successful resolution resulted in the resumption of contracts to private airlines. As a result of their interactions, Morgan hired Webb as the personnel director and assistant to the president of Sperry. Between 1936 and 1944, Webb became the secretary-treasurer and later the vice president of Sperry. During his tenure, Sperry expanded from 800 employees to more than 33,000 and became a major supplier of navigation equipment and airborne radar systems during World War II. Although he wished to re-enlist in the Marines at the start of the war, he was deferred because of the importance of his work at Sperry to the war effort. By 1944, however, he was allowed to re-enlist in the Marines, where he became the commanding officer, First Marine Air Warning Group, 9th Marine Aircraft Wing, first as a captain and later as a major. He was put in charge of a radar program for the invasion of the Japanese mainland. He had orders to leave for Japan on August 14, 1945, but his orders were delayed, and the Surrender of Japan on September 2, 1945 meant that he did not see combat. After World War II, Webb returned to Washington and served as executive assistant to Gardner, now the Undersecretary of the Treasury, for a short while before he was named as the director of the Bureau of the Budget in the Office of the President of the United States, a position that he held until 1949. Webb was recommended for the appointment to Truman by Gardner and Treasury Secretary John Snyder. During the appointment announcement, Truman forgot Webb's name and had to look it up. Because of Webb's association with the Treasury Department, his appointment was seen as subordinating the BoB to the Treasury. His appointment surprised Webb, who had not been told of the final decision to appoint him. The Bureau of the Budget prepared the President's proposed budget each year for presentation to Congress. Truman's objective for the budget was to bring it to balance after the large expenditures of World War II. President Harry S. Truman next nominated Webb to serve as an undersecretary of state in the U.S. Department of State, which he began in January 1949. Webb's first assignment from Secretary Dean Acheson was to reorganize the Department, adding 12 new Presidential appointees and reducing the power of subordinate officers. Webb also consolidated the flow of foreign policy information and intelligence through the secretariat. When the new organization became law in June 1949, the Department, which had been losing power and influence to the military, strengthened its ties to the President. Webb joined the State Department during McCarthyism, and the Department was under considerable pressure from Congress to root out communists, anarchists and others deemed un-American and a security risk. Webb met with Truman in 1950 to discuss the administration's response to the Congressional hearings. Webb testified to a Senate committee that most of the people removed from the government for moral turpitude were homosexuals. Although the White House was not politically able to quell Congressional fervor, it implemented a strategy to emphasize the medical aspects and downplay the security concerns of homosexuals in the government. One of the biggest questions facing the Department of State at the time was whether the Soviet Union could be contained through only diplomatic means or whether the military would be needed. Paul Nitze, as Director of Policy Planning, wrote a classified memo, NSC 68, arguing for a military build-up of NATO forces. Although Secretary of Defense Louis A. Johnson opposed an increase in the Defense budget, Webb got Truman to convince him to support the recommendations of NSC 68. On 25 June 1950, the North Korean Army invaded South Korea. Webb and Secretary Acheson and devised three recommendations: involve the United Nations, send the Navy Pacific Fleet into the Yellow Sea, and authorize an Air Force strike on the Korean tanks. Truman implemented the first two recommendations immediately but delayed the use of force by several days. The Defense Department was blamed for the lack of US preparedness, and Johnson tried to blame Acheson. Webb worked with his contacts in Congress and others to convince Truman to replace Johnson, and George Marshall was called out of retirement to become the new Secretary of Defense. Pursuing his scientific interest, Webb sought to increase the propaganda role in the Cold War. He set up an alliance with university scientists, Project Troy, to study radio propagation behind the Iron Curtain. With the attention of the Department focused on the Korean War, Webb's influence weakened. As the author of NSC 68, Nitze became the principal advisor to Secretary Acheson, and a misunderstanding between Webb and Nitze led to Nitze outwardly calling for Webb's resignation. Although the rift blew over, Webb started suffering from migraine and resigned in February 1952. Webb left Washington for a position in the Kerr-McGee Oil Corp. in Oklahoma City, but he was still active in government circles, for instance in serving on the Draper Committee in 1958. On February 14, 1961, Webb accepted President John F. Kennedy's appointment as Administrator of NASA. Webb directed NASA's undertaking of the goal set by Kennedy of landing an American on the Moon before the end of the 1960s through the Apollo program. For seven years after Kennedy's May 25, 1961 announcement of the goal of a manned lunar landing until October 1968, Webb lobbied for support for NASA in Congress. As a longtime Washington insider and with the backing of President Lyndon B. Johnson, he was able to produce continued support and resources for Apollo. During his administration, NASA developed from a loose collection of research centers to a co-ordinated organization. Webb had a key role in creating the Manned Spacecraft Center, later the Johnson Space Center, in Houston. Despite the pressures to focus on the Apollo program, Webb ensured that NASA carried out a program of planetary exploration with the Mariner and Pioneer space programs. After the Apollo 1 accident in 1967, Webb told the media, "We've always known that something like this was going to happen sooner or later... Who would have thought that the first tragedy would be on the ground?" Webb went to Johnson and asked for NASA to be allowed to handle the accident investigation and to direct its recovery, according to a procedure that was established following the in-flight accident on Gemini 8. He promised to be truthful in assessing blame, even to himself and NASA management, as appropriate. The agency set out to discover the details of the tragedy, to correct problems, and to continue progress toward the Apollo 11 lunar landing. Webb reported the investigation board's findings to various congressional committees, and he took a personal grilling at nearly every meeting. Whether by happenstance or by design, Webb managed to deflect some of the backlash over the accident away from both NASA as an agency and from the Johnson administration. As a result, NASA's image and popular support were largely undamaged. Webb was a Democrat tied closely to Johnson. However, and with Johnson choosing not to run for reelection, he decided to step down as administrator to allow the next president, Republican Richard Nixon, to choose his own administrator. Webb was informed by CIA sources in 1968 that the Soviet Union was developing its own heavy N1 rocket for a manned lunar mission, and he directed NASA to prepare Apollo 8 for a possible lunar orbital mission that year. At the time, Webb's assertions about the Soviet Union's abilities were doubted by some people, and the N-1 was dubbed "Webb's Giant." However, later revelations about the Soviet Moonshot, after the collapse of the Soviet Union, have given support to Webb's conclusion. Webb left NASA in October 1968, just before the first manned flight in the Apollo program. 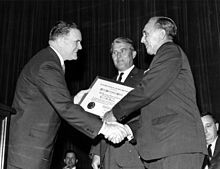 In 1969, Webb was presented with the Presidential Medal of Freedom by Johnson. He is a 1976 recipient of the Langley Gold Medal from the Smithsonian Institution. After retiring from NASA, Webb remained in Washington, DC, serving on several advisory boards, including serving as a regent of the Smithsonian Institution. In 1981, he was awarded the Sylvanus Thayer Award by the United States Military Academy at West Point for his dedication to his country. Webb died in 1992 and was buried in Arlington National Cemetery. Webb was married to Patsy Aiken Douglas in 1938, and they had two children: Sarah Gorham Webb (b. 1945), and James Edwin Webb, Jr. (b. 1947). Webb was played by Dan Lauria in the 1998 miniseries, From the Earth to the Moon. Webb was played by Ken Strunk in the 2016 film, Hidden Figures. NASA's planned James Webb Space Telescope was renamed in Webb's honor in 2002. This telescope, to be launched in 2021, is referred to as "the Hubble successor". ^ Sumner, Jim. "Tar Heels in Space" (PDF). NC Museum of History. Archived from the original (PDF) on April 17, 2012. ^ a b "James E. Webb". NASA. ^ http://www.lbjlibrary.net/assets/documents/archives/oral_histories/webb-j/webb.pdf Webb oral biography. Transcript, James E. Webb Oral History Interview I, 1969/04/29, by T. H. Baker, Internet Copy, LBJ Library. Accessed May 28, 2009. ^ Slayton, Donald K. "Deke"; Cassutt, Michael (1994). Deke! U.S. Manned Space: From Mercury to the Shuttle (1st ed.). New York: Forge (St. Martin's Press). pp. 216–217. ISBN 0-312-85503-6. LCCN 94-2463. OCLC 29845663. ^ "NASA Completes Webb Telescope Review, Commits to Launch in Early 2021". NASA. June 27, 2018. 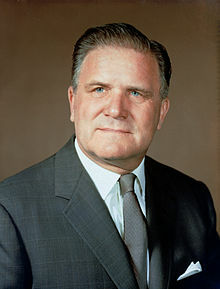 Wikimedia Commons has media related to James E. Webb. This page was last edited on 18 March 2019, at 13:10 (UTC).